The Spoils program started by Atlus a while ago continues with Hammerin’ Hero for PSP, who will deliver fans who pre-order the game a set of collectible figurines. The offer only goes if you pre-order the game from GameStop (in stores or online) so don’t start a scandal if other shops won’t give you any real Hammering Heroes. Not available for sale separately, the miniature versions of Gen-san and his damsel in distress are lovingly rendered and detailed. They’re also rather potent emblems of fandom. Nothing says “I love games and I possibly spend too much time thinking about/playing them” than a set of collectible figurines – that if, of course, you really want to say that! 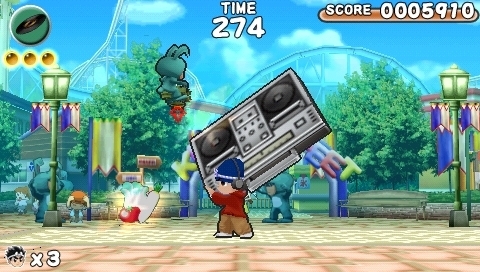 Hammerin’ Hero is an arcade-style, old school, side-scrolling beat ’em up for PSP which is scheduled for release on April 7 this year with a RRP of $29.99.